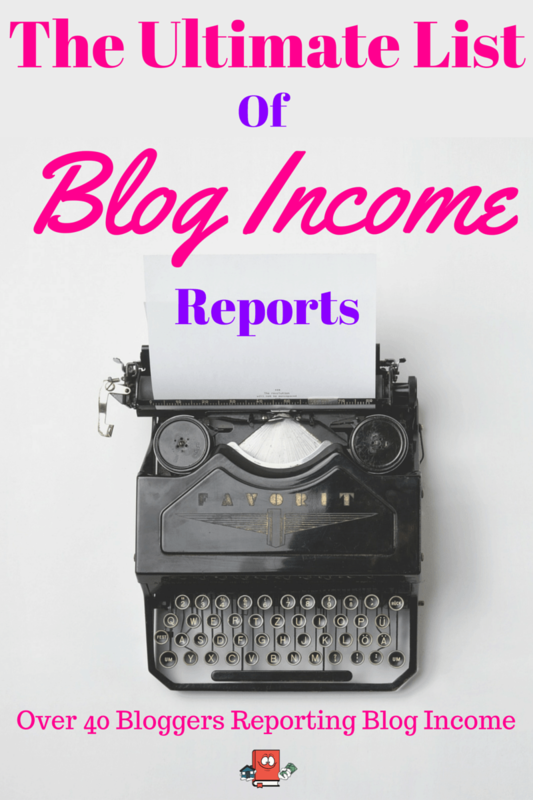 Isn’t “Passive Income” a beautiful thing? I mean deep down inside, passive income aka cash flow is what everyone wants. I mean why would someone not want this? I know this is what I want, as a matter of fact, it is an obsession of mine to build up so much passive income that I can retire from it. Imagine being able to do whatever you wanted, whenever and where ever you are and not have to worry about income. It sounds like a dream life doesn’t it?! Fortunately for all of us, generating passive income can be achieved by anyone. If you are savvy enough to invest in the right kind of investments, make good decisions and do the right things, you too can generate passive income. Look at me, I am just a regular Joe Schmoe (ordinary person) and I am doing it. There is nothing special about me. I don’t even have a bachelor’s degree. I am in my mid thirties and plan on being fully retired by my mid 40s at the latest. And by retired, I don’t mean farting around the house doing nothing. I just mean not having any obligations to anyone and being able to do whatever I want in life. This most likely means I will still find something to do and keep me occupied. I could volunteer somewhere, start up my own personal little side business or anything. We’ll see. What I can tell you is that there will be a lot of outdoor activity involved in that future life I will have. Based on these numbers, I am making an extra $2k per month just on passive income generated by my real estate investments. That is pretty good but keep in mind here that I do not and am not planning on using this money anytime soon. All this money just piles up in a checking account I have and I will only use that money to put right back into the real estate properties. 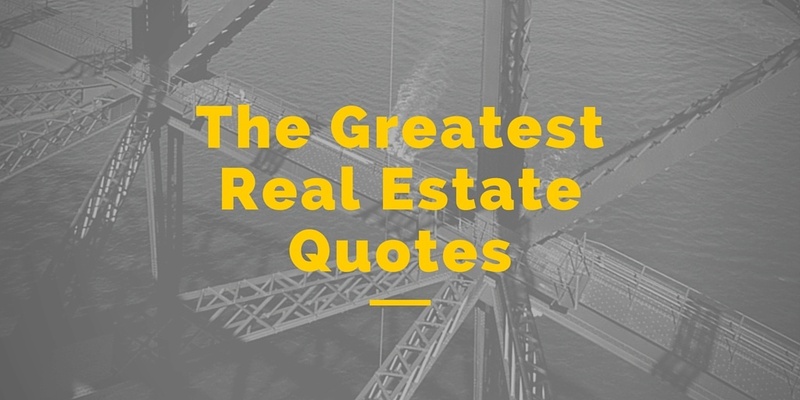 Whether it’s through paying for repairs/vacancy or just flat-out buying new properties. This monthly passive income will also change each and every month based on what kinds of issues I have with each property. This may seem like I am making a lot of money in passive income but the reality is that it will be less than this after I account for future vacancies and repairs. 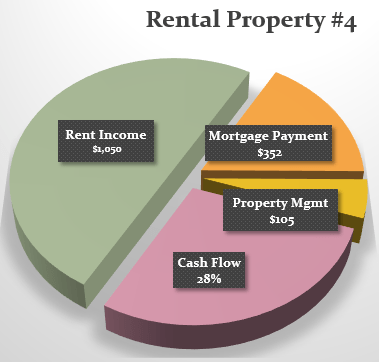 This is why it is very important for you to include these projections in your calculations when you are analyzing rental properties. 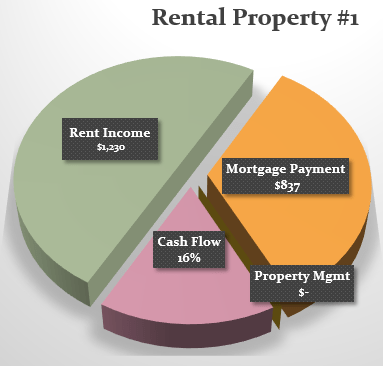 Here is an example for you to see of my first turnkey rental property, as you can see in the numbers, I am projecting 10% of the rent income to account for future vacancies and another 10% to account for future repairs. Although I did not have to use any of the money this month, I will have to use it in the future and my passive income will decrease. It is very important you understand this. My plan for now is to continue buying rental properties and increasing my cash flow. At some point, not sure when, I will feel comfortable enough to quit my day job but that is not going to happen anytime soon. If I continue at the same pace I have been on the last 2 years, then maybe in 5 years I can retire. And that would be assuming everything works out great and I get lucky. Realistically speaking, I probably wont be able to retire until my mid 40s which is about 10 years from now. However if I can find additional ways to grow my mini real estate empire, then I might be able to do it sooner. We’ll see. 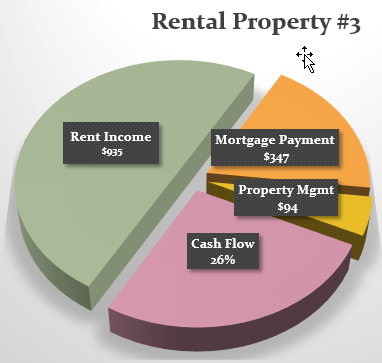 Also if you have time check out Reluctant Landlord’s cash flow report as well. 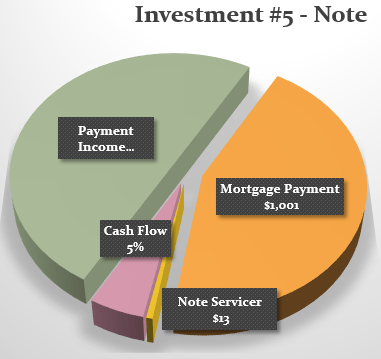 It’s fascinating seeing cash flow reports from other real estate investors. Very good month! Gotta love those months with no expenses and no vacancies!!! Absolutely right that it is critical to count on these for the future though. I have a question, if I may, about your performing note. This is an area that I am very interested in looking at. Do you have any resources you’d recommend for getting started? Also, I notice you have a mortgage payment on it–were you able to find a lender to lend you the money to buy the note, and you are pocketing the spread? That is fantastic! Thanks Nate!! The note is actually a self generated note. Meaning I bought that house cheap (foreclosure) and turned it around and sold it via an owner finance shortly after for more. So I bought the house with a mortgage, then sold it and now I get payments from the buyer and use that to pay the underlying mortgage. Its more commonly known as a wrap-around mortgage. Its kind of confusing. Looking good! Congratulations on a fantastic month! Thank you Rick! Appreciate it! Hopefully the months ahead will look like this too! You are correct though, eventually the repairs will make a dent into cashflow. I had one property that didn’t require any maintenance for over two years, and then it seemed like everything broke at once! Oh well, as long as it’s predictable over the long term, it’s fine. Do you have a favorite property of the 4 currently? Thanks Michael! Yep I think in the long run I will be just fine. There is enough cash flow in these deals to handle repairs and issues and still come out ahead. Hopefully I will continue to have good tenants though to help ease the pain. Ha! As far as favorite? I guess my favorite is #4 above. One because it makes me the most money and two because its a house I would live in. Its in a really cool area of Indy which I like a lot. I’ve been following your blogs for the last few months since you started doing them, and have been very impressed. I’m in my forties, yet most of my retirement assets are in a 401K, 457b, and IRA’s. However, I would like to get into Rental properties if possible, as I already own my own home and understand the value, and the passive income that a rental can create. I’m curious to ask, how much down did you have to put to get your loans for the turnkey rental properties? After your first one, was the loan process easier… were you able to use the equity assets from the real estate holdings you now have to secure the next loans? Thanks! Hey Gearmaster! Thanks so much for following and I appreciate the remarks. I think its great that you have all those retirement assets and its even better that you want to diversify into rental properties. That would be a smart move I think. For my first 4 mortgages I put down 20%. The last 3 I had to do 25%. There is a rule where mortgages 5 thru 10 have to have a 25% down payment. You can find more details about how I setup the mortgages on this post including which assets my lender uses to qualify me. But to answer your question, it is easier after the first one and especially after you find a lender that knows you and trusts you for the next ones. Great, thanks for the reply and useful info! Have you ever looked into self directed 401k’s or self directed IRA’s? You can own real estate within a self directed IRA or lend money within a self directed IRA. It is a great way to not pay taxes on profits that you earn on real estate investing. I have actually been thinking about getting a self directed IRA for the last few months just havent pulled the trigger. I do agree its a great idea. I looked into Self-Directed IRA’s, but because those IRA’s have Trustees or Custodians with limited duties to investors, the risk of fraud seemed very high. I prefer to do what Alexander has been doing, which is to save-up for a down-payment and purchase a rental property outright where I have more control over what’s happening with the monies I have invested, and the bank’s money I’d be using in a structured mortgage. Congrats on a great month! With the markets rebounding, our portfolio did well last month too. Thanks Steve! Happy to here your portfolio did well. Hopefully we maintain this positive growth! Putting away money for repairs is a smart thing. What about repairs vs capital expenses? A leaky toilet is one thing, a bathroom update is another. 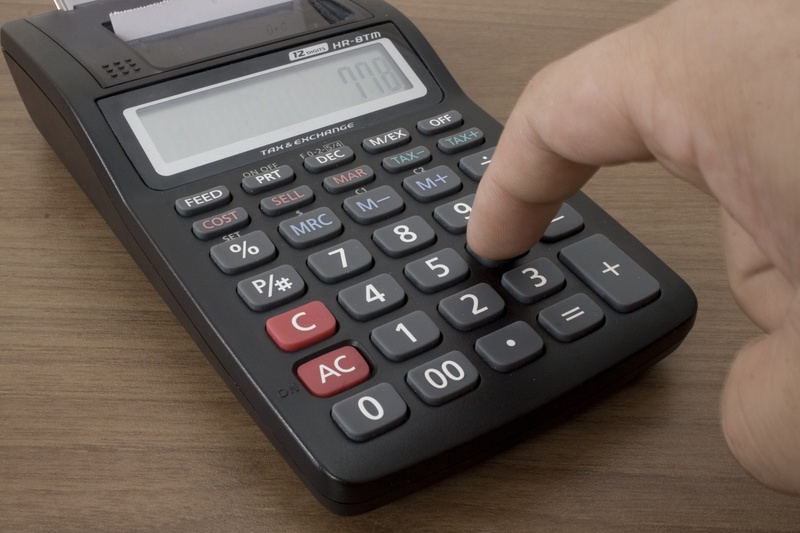 Have you calculated the cost of that future roof replacement, windows, floors, furnace, water heater, electrical panels, plumbing, kitchen update, bathroom updates etc etc. When I started doing that, I realized my 10% reserves were not adequate. Think about it this way. Say you have a 10k roof replacement (assuming 3% inflation) in 10 years. You would have to set aside $83.3/month just for 1 roof. These repairs will cost the same regardless of your rent. A roof in St. Louis on 30k property will be about the same as a California roof on a 500k property of the same sq footage. I think if you sit down and put together a 20 year replacement/upgrade plan, you will be surprised at what you should save. Some food for thought that I have learned the hard way on my 9 units. Keep up the good blog, we are all enjoying your progress. This is one reason why I only buy houses with brand new everything so I can defer capex for as long as possible. Hopefully 15 years. On house 1 for example, if I set aside 10% of rent each month for 15 years, that equals $22k. Somewhere in that 22k there is enough money for a $500 water heater, $6k roof and $3500 HVAC I would think. But yes you are right, realistically speaking I probably need to set aside more but this is also not accounting for future rent appreciation which will inevitably happen as well. At the end of the day, its impossible to project for exact actual numbers. Every property and every tenant will be different but what I can tell you though is years down the road when Im making 15k per month in passive income. I will be okay setting aside a few months income to take care of the houses for capex. Just part of being in the rental game. Glad you’re thinking ahead. In the last 8 year we have had 10k stolen by property managers, lost around 5k in delayed vacancies, and over 30k in repairs due to tenant damage. Those reserves were vital. Good luck and can’t wait to hear more progress. That is insane! I hope I am doing everything possible to prevent those types of things happening by buying in good areas with plenty of tenant pool selection, having a really good and well vetted PM on my side and making sure they screen the heck out of those tenants. Did you end getting rid of those properties? Or switching PMs? Thanks so much!! Yep I dont plan on stopping anytime soon. The more I can get, the faster I can achieve my goal. I cant imagine how different my life will be in the future. It will be awesome! 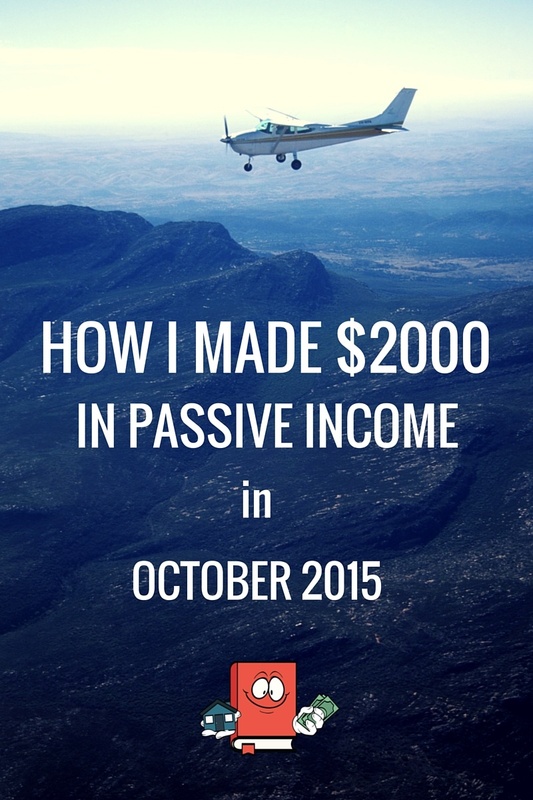 Wow, great job with the passive income…and yes, passive income is definitely a beautiful thing. Also read your BP post recently too…very informative. Like others in the comments on this post and the BP post, some mentioned capital expenditures which got me a little worried, but you addressed those issues in your response. Thanks Andrew!! I do love me some passive income. Its the best thing out there and at the end of the day, it will be passive income that allows me to live my life the way I want to. Yes Capex will always be an issue with ALL rental properties but as long as you accept that, you should be okay. Apart from rental properties and dividend stocks, there really isn’t a lot of options out there on making passive income. Just need to pick your poison you know! Been following your blog for the last month. It’s pretty cool. I use turnkeys and dividend paying stocks as my passive income route. You’re right though in the turnkey rehab being as new as possible. I know that sometime down the road, vacancies/capex/repairs will happen. However, if the rehab is top quality, then you’ll have a ways until that dreaded “roof replacement”. That said, vacancies are a little more unpredictable, but I try to mitigate this by having an excellent property manager. A happy tenant is one that is less likely to leave. I use my dividends as my “piggy bank” in case any big expenditure comes my way. I have it structured so that I get dividend checks hitting my brokerage account every month. Some months pay out more than other months, and it gets kind of “lumpy”, but it’s great knowing I have cash flow checks from my rentals and dividend checks coming in every month. What keeps this account growing is that I reinvest the dividends every month along with fresh capital from the rentals. Excellent blog by the way. thanks for the info on kansas city. Hi j. Wow sounds like you are doing great. I really like how you are diversified in rentals and stocks/dividends. That is one spot I am lacking in but I recently started reading up on it. I would love to put some cash into dividend paying stocks or ETFs or something. Honestly I do not know much about it yet which is why I am in research mode. Since you invest in turnkeys also you might be a great fit to be part of my Turnkey Interview series. If you would like to participate let me know. I would appreciate it. I really appreciate your comments on the blog too. Thanks so much!! maybe next year sometime. gonna tackle some debt first. Keep up the great work and hope all is well! Thanks so much Jef! I guess I will make it a full time gig when I quadruple what Im making now but it will never really be a full time gig. To be honest, I dont spend a whole lot of time on it. Most of the year Im just saving money to purchase and when I purchase it takes about 5 to 6 weeks from beginning to end. I imagine when I do quit the day job that my full time gig will probably be this blog and to continue investing. Seems like your $2000 is more of an ebitda number, have you calculated your passive return after other expenses? No those number do include ebitda. The only thing they do not include as i indicated in the post was future repairs/vacancy and expenses because I will only include those as they happen.